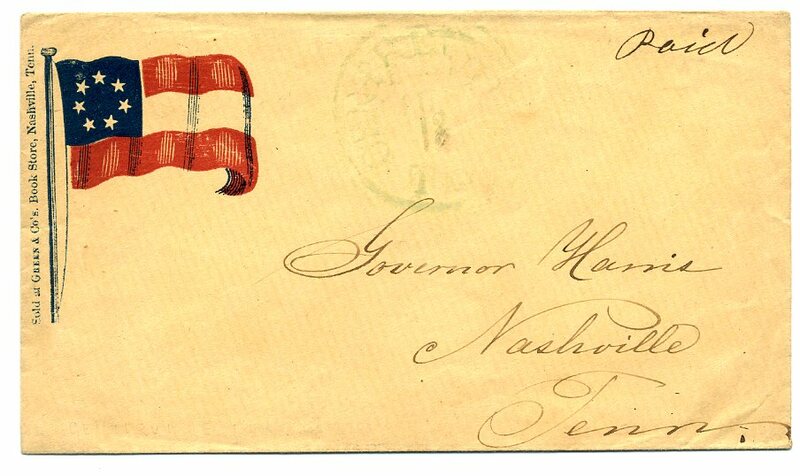 US 26, 3¢ dull red tied by light BROWNSVILLE / TEN // APR / 17  cds on overall 7-Star Confederate Flag Patriotic (CC F7-2B, CCV $4,500, with the prominent flagstaff compared to F7-2A which lacks the flagstaff), second strike on back, to Messrs. Leon Berg & Co., Philadelphia. Pa., barely reduced at right. Rarely found in such nice condition, 1987 PF certificate 0176776. $3,800. 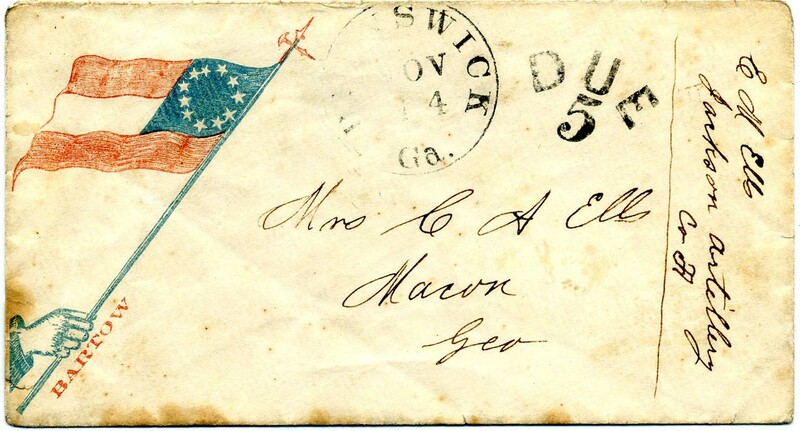 US 26, 3¢ dull red, straddle-pane copy tied by CHARLESTON / S.C. // MAY / 12 / 1861 cds on 7-Star Confederate Flag Patriotic (CC F7-7B, CCV $1,500) to Unionville S.C., missing top flap, Very Fine, ex Calhoun. $1,300. 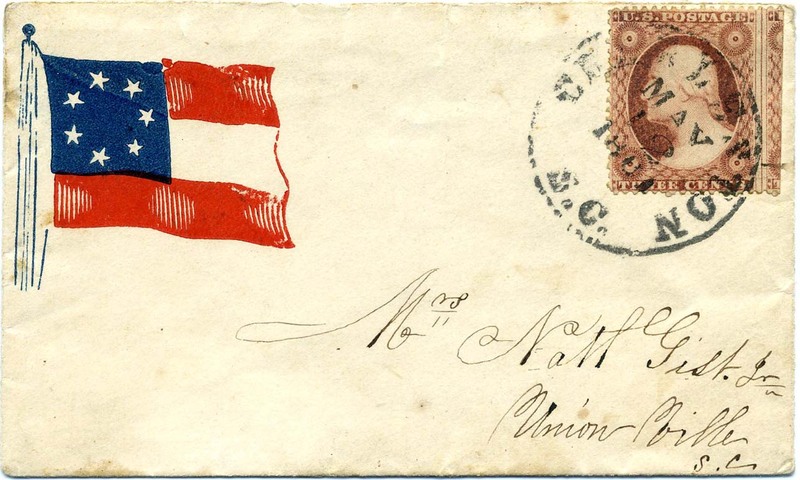 US 26, 3¢ dull red (irregularly separated at left) tied by neat SAVANNAH Ga. // MAY / 17  cds on 9-Star Confederate Flag Patriotic (CC F9-2B, CCV $4,000), small stain at top and back flap tears just extend to couple short tears at bottom, otherwise Fine, the ninth star represents the admission of Arkansas, which was followed only three days later by North Carolina, due to this short time period there were fewer 9-Star Confederate Patriotic designs produced than any other flag designs (7 thru 13 stars). $3,000. 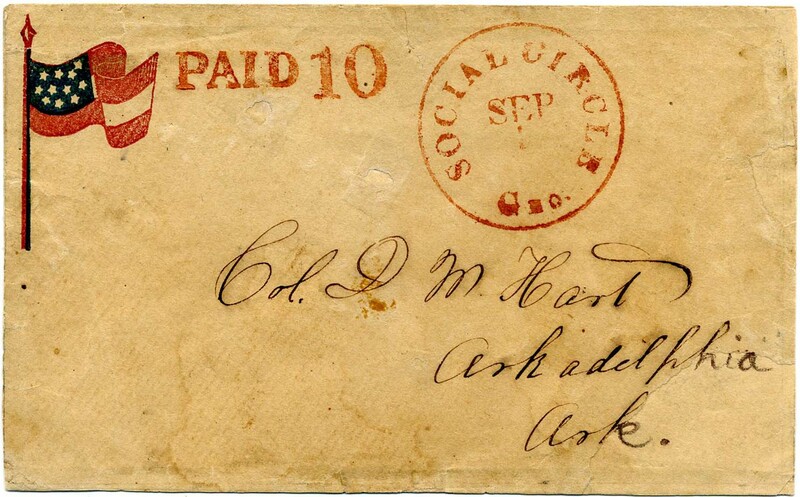 US 26, 3¢ dull red tied by neat SAVANNAH Ga. // MAY / 30 / 1861 cds on cover to Thomas Prosser & Son, 28 Platt St., New York City, N.Y., with 7-Star Confederate Shield Patriotic Sticker (CC ST-7, CC $2,000), faint strike of oval handstamp, back flap with red embossed patent seal for Thos. 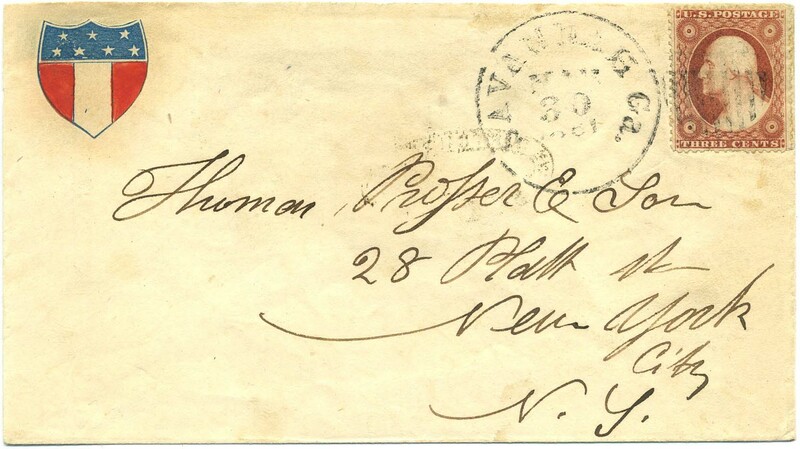 Prosser & Son New York who is also the addressee, stamp with a few short perfs, Very Fine, Confederate States use of US postage, ex Duckworth; these are very rarely tied and expertizing bodies frequently offer a “no opinion” when submitted; serious patriotic sticker collectors recognize this, therefore offered on its own merits. $1,500. 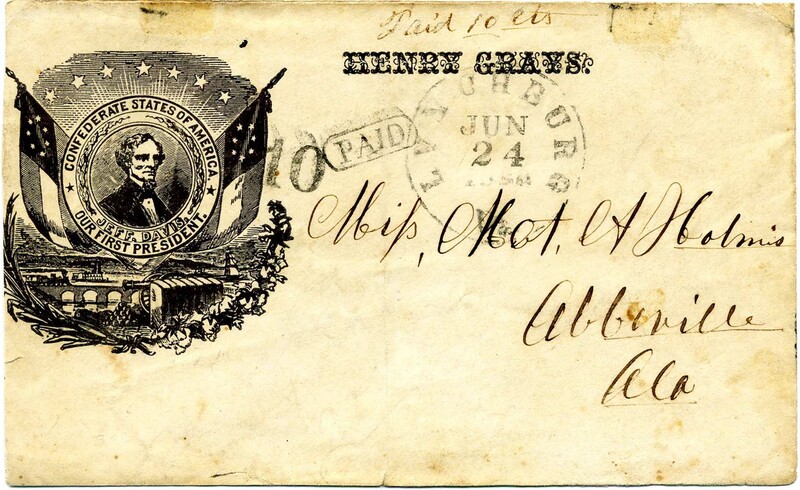 LYNCHBURG / Va. // JUN / 24 / 1861 cds with matching PAID in oval and "10" rate handstamp on Jefferson Davis Medallion, 7-Star Flags, Sunburst and "Henry Grays" Regimental Patriotic cover (JD-1A var, Slogan 50, CCV $1,000), also manuscript "Paid 10 cts," slightly reduced at left, minor toning, vertical fold and splits along edges, , ex Dr. Warren, with 1998 CSA certificate 03165. $850. 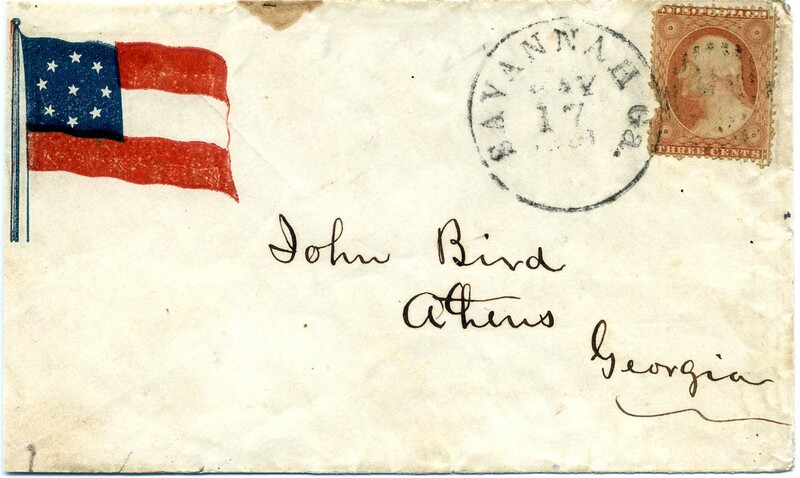 Hand-carried Jefferson Davis Patriotic (JD-1A, Verse 31, CCV $1,000) addressed to R. J. 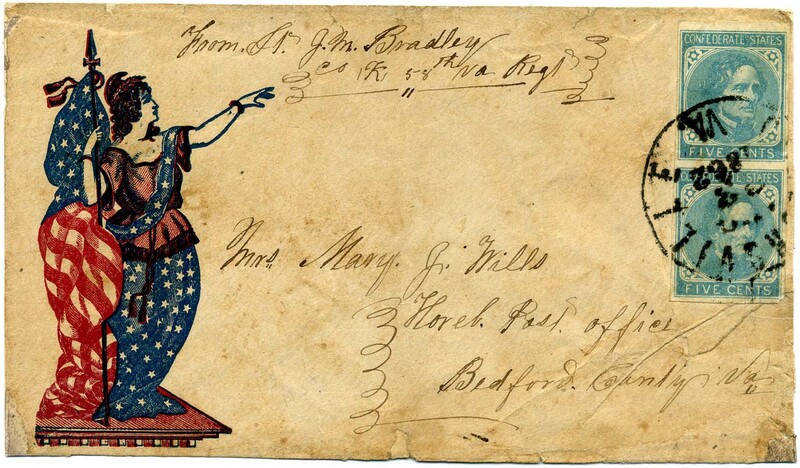 Van Hook, Columbus, Miss., with manuscript "Mail" at bottom (possibly a soldier's letter), matching manuscript "Let her wave" at top, missing back flap, small edge tear at top, stain in address. There is listed an R. J. Van Hook who served in the Alabama Reserves. $375. CLEMMONSVILLE / N.C. // MAR / 20 /  cds with matching PAID 5 (CC type A, $250 for ordinary stampless use) on red Jefferson Davis Medallion, 7-Star Flags, Sunburst and Verse Patriotic cover (JD-1A, Verse 31, CCV $1,000), to Miss E. D. Dickson, Salem, N.C., with original enclosure dated March 18 from mother to daughter, small toned specks, couple smalls edge tears and back flap reattached with archival tape. There are many fakes of this postmark done with a genuine canceling device after the war, easily recognizable by the dented rim. This is a completely genuine example. $850. 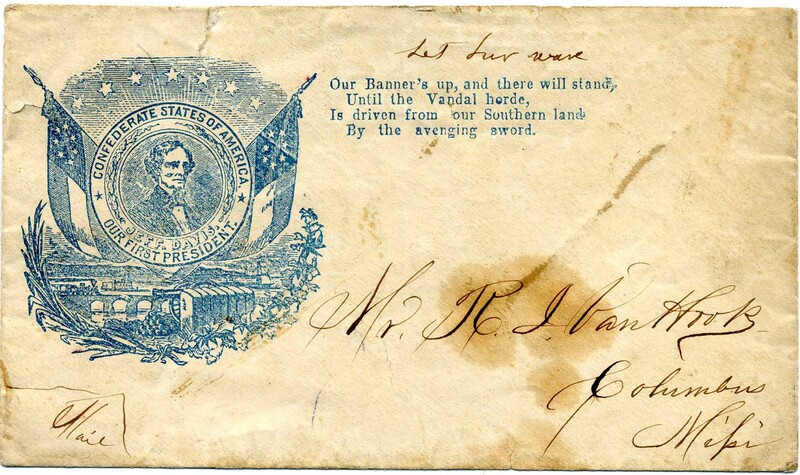 RICHMOND / Va. // SEP / 23 / 1861 lightly struck cds with matching PAID 10 in circle handstamp on blue Jefferson Davis Medallion, 7-Star Flags, 10-Star Sunburst and Verse Patriotic design (JD-1B, Verse 26) and RARE Natchez Rifles, Capt. A.V. 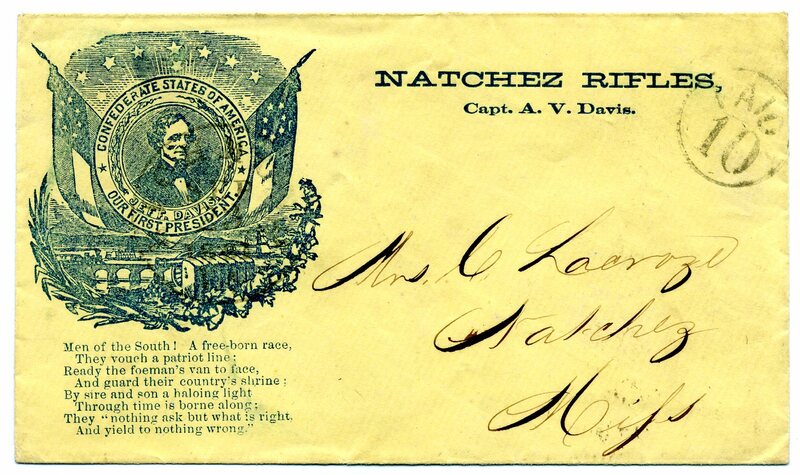 Davis REGIMENTAL IMPRINT at top, some mounting remnants on back, addressed to Mrs. C. Lacrozo, Natchez, Miss., Extremely Fine. A similar cover in red and blue sold in the Dr. Ralph Brandon collection for $4,600. $2,500. Capt. Alfred Vidal Davis, Sr. commanded the Natchez Rifles, Company E, 4th Louisiana Battalion. Davis owned a slave, John Roy Lynch, who became one of the first African-American congressmen. Much more information on linked page. MEMPHIS / Ten. // NOV/ 1? 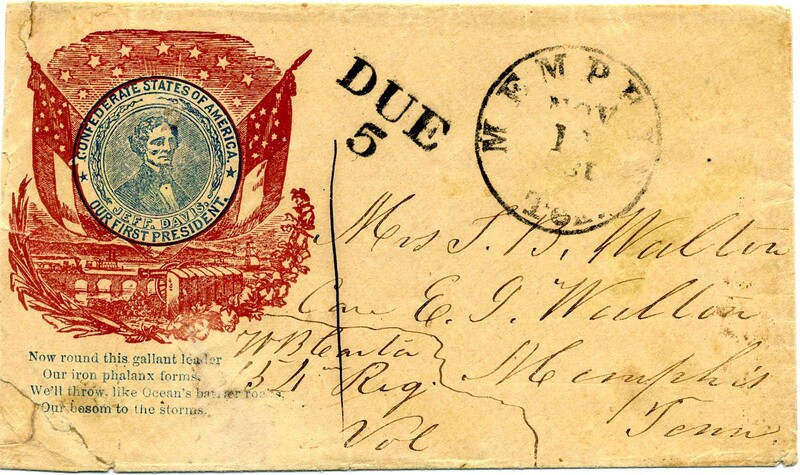 / 1861 cds with matching bold DUE / 5 handstamp on dark red and light blue Jefferson Davis Medallion, 11-Star Flags, Sunburst and Verse Patriotic cover (JD-1C, Verse 28), to Mrs. T. B. Walton, Care E. J. Walton, Memphis, Tenn., slightly reduced at left with few sealed tears at edge. The shades of the red and blue colors are very unusual; illustrated in Wishnietsky's Confederate Patriotic Covers and Their Usages on page 120. Mandated soldier endorsement of W. B. Carter, 15th Reg. Vol. (state not specified – good doable research project) $1,100. 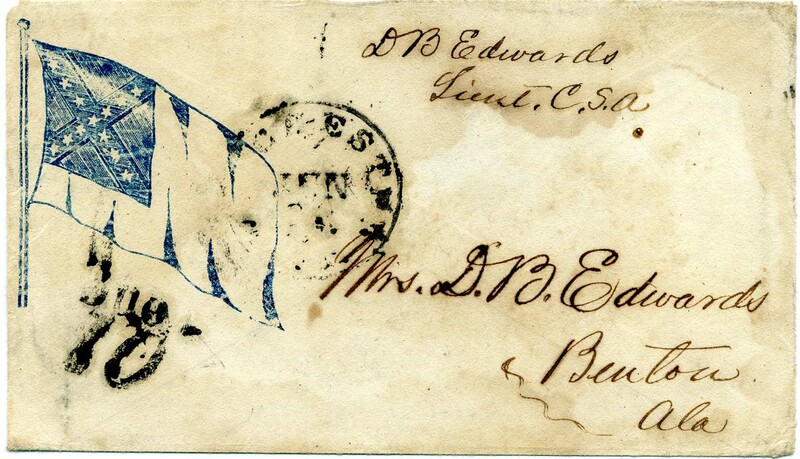 CHARLESTON / S.C. // OCT / 1 / 1861 cds with PAID 5 in circle handstamp on 7-Star Confederate Flag Patriotic cover (F7-7B, CCV $1,500) to Miss Emgeline Neighbours, Pendleton S.C., barely reduced at right, some slight wear and soiling, still Very Fine and attractive cover, ex Toaspern, Gallagher, Calhoun and Kilbourne. $800. 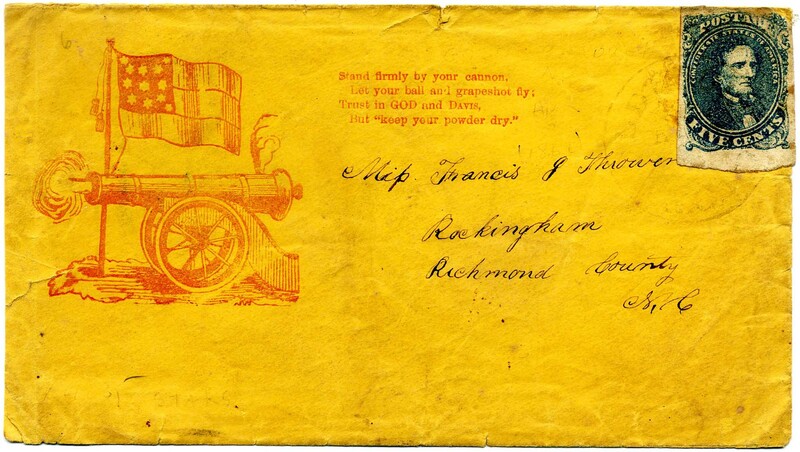 RICHMOND / Va. // JUL / 31 / 1861 cds with matching PAID / 5 Cts handstamp on small size 10-Star Confederate Flag Patriotic cover (F10-3, CCV $1,000) to Bremo (Bluff) Va. Care of Dr. Charles Cocke, Very Fine. Ex Rosenberg. $1,100. 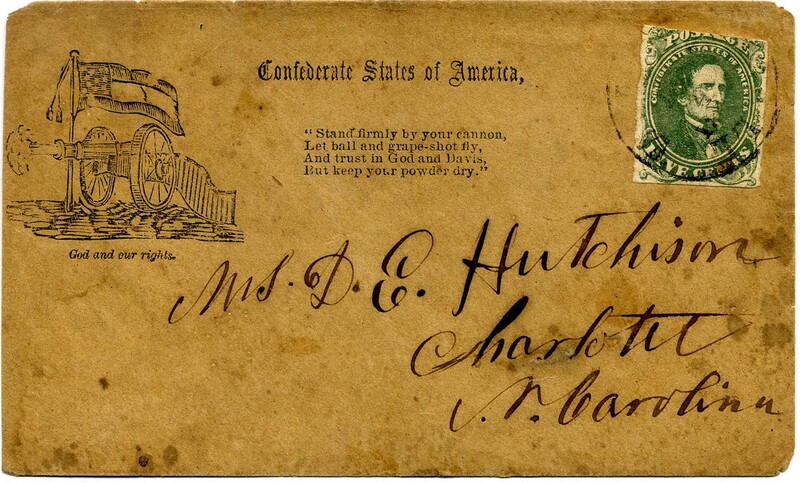 BRUNSWICK / Ga. // NOV / 14  cds with matching DUE 5 (type C) on Hand-Held "Bartow" 11-Star Confederate Flag patriotic cover (F11-9, Slogan 3, CCV $1,500), with soldier's endorsement from E. M. Ells, Jackson Artillery, Co. A., home to Mrs. C. A. Ells, Macon, Geo. some small edge stains and back flap opening tears. $650. Edward M. Ells served in Capt. Massenburg’s Battery Georgia Light Artillery (Jackson Light Artillery), Capt. George A. Dure’s Company, Army Northern Virginia, age 21. Much more information on linked page. SOCIAL CIRCLE / GEO. // SEP / 1? 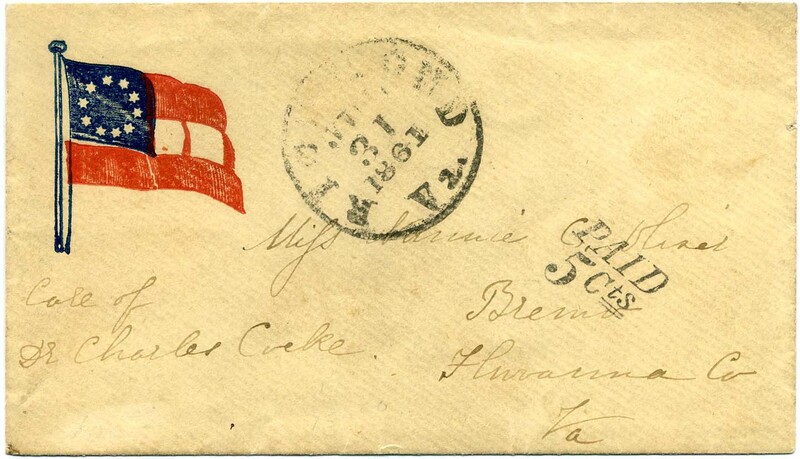 bold red cds with matching PAID and 10 (type B, CCV $300) handstamps on fresh rebacked 11-Star Confederate Flag Patriotic cover front (F11-13, CCV $3,500), reduced at right, repaired opening tears and small erosions, and part of address written in, with 2018 PF certificate; while the back is reattached, it appears to be original to the front, addressed to Col. D. W. Hart, Arkadelphia, Ark, ex Kohn and Kilbourne. Combined CCV $3,800. $1,200. 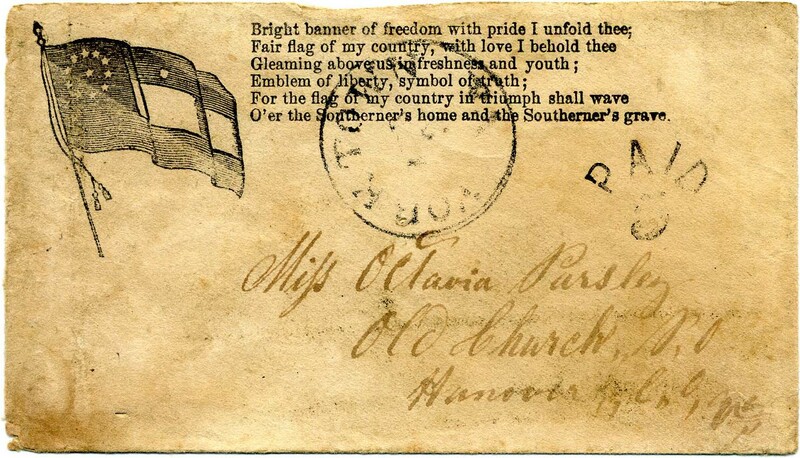 YORKTOWN / Va. [MAR 1862] cds with unreadable date, matching PAID 5 on 11-Star Confederate Flag and Verse Patriotic design (F11-17, Verse 5, CCV $1,500), original letter datelined Yorktown March 31, 1862, some wear and damp staining, missing back flap, letter with edge splits, otherwise Fine. $700. WINCHESTER / Va. // JUN / 24 / 186? cds with matching DUE 10 on rare blue 13-Star Confederate Jackson Flag patriotic cover (F13-4A, CCV $3,500), lightly cleaned, endorsed by D. B. Edwards, Lieut., C.S.A. home to his wife in Benton, Ala. The second national Confederate flag, also known as the "White Jackson Flag" and "Stainless Banner," was adopted by the Confederacy on May 1, 1863. 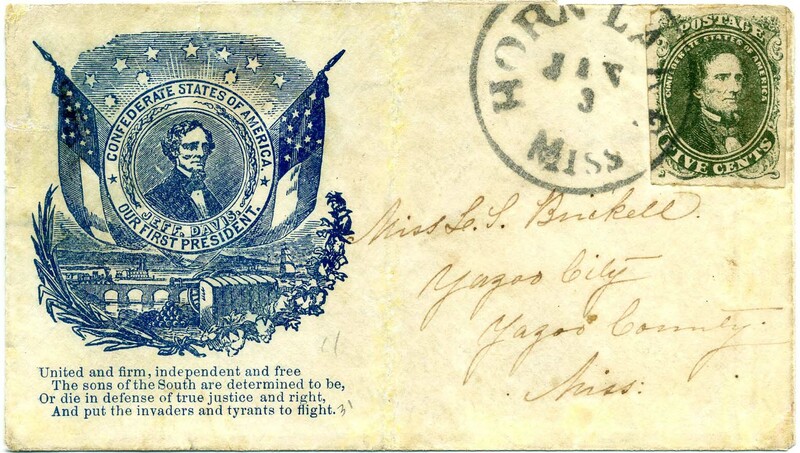 Very few examples are known on patriotic covers, as by 1863 paper shortages and printing expenses vastly decreased their use. Ex Ashbrook, Bogg, and Kilbourne. Illustrated in Wishnietsky's Confederate Patriotic Covers and Their Usages on p. 87. $1,700. Daniel B. Edwards served as captain of Company A, 44th Alabama Regiment, Law’s Brigade, Hood’s Division. Much more information on linked page. CORINTH / Miss. // JUL / 18 /  cds with matching PAID / 5 (type C, $300 just for marking) in oval, beautiful clear strikes on 11-Star Confederate Flag, Cannon and Verse patriotic cover (CN-1B, Verse 28, CCV $750) to Miss P. S. Hamilton, Laurel Hill, West Feliciana [Parish] La., minor wear, Very Fine, Ex Bowman and Kilbourne, combined CCV $1,050. $1,300. 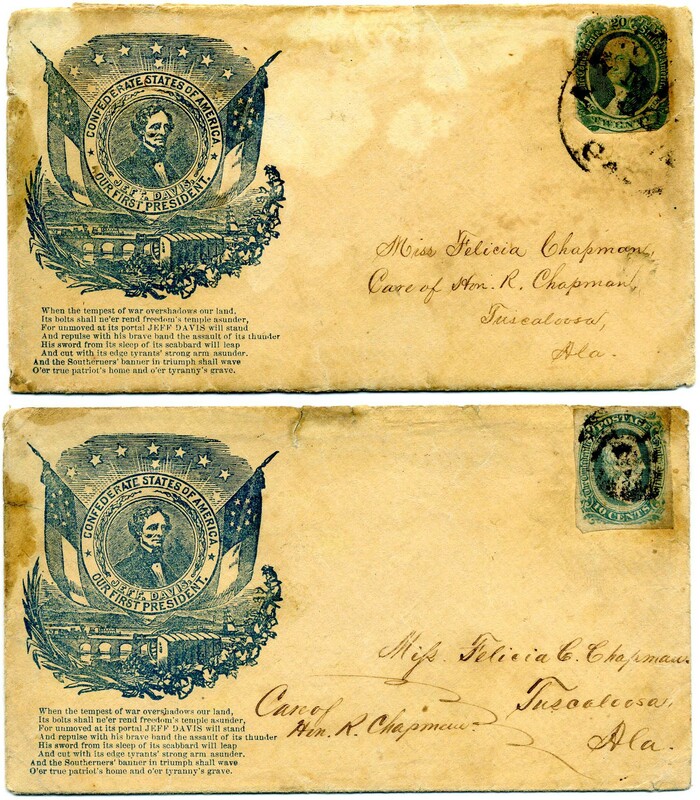 CSA 11-AD and CSA 13: two matching covers to Miss Felicia Chapman, Care of Hon. 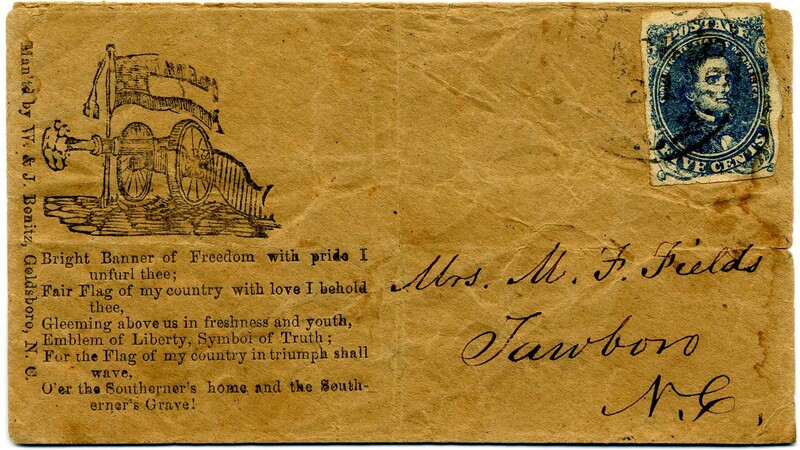 R. Chapman, Tuscaloosa Ala. from her cousin John F. Wilkerson, in the field with the 6th Tennessee Regiment, Army of the Tennessee, both with matching blue Jefferson Davis Medallion, 7-Star Flags, 10-Star Sunburst and Verse Patriotic design (JD-1B, Verse 53), 10¢ with blurry strike of what is likely Army of the Tennessee field cancel, 20¢ with corners clipped and tied by ATLANTA / Ga. cds, with original letter datelined near Atlanta, May 28, 1864, outstanding lengthy war and political commentary (see excerpt that follows), both covers with toning small edge tears. OUTSTANDING WAR CONTENT with full transcriptions that accompany. 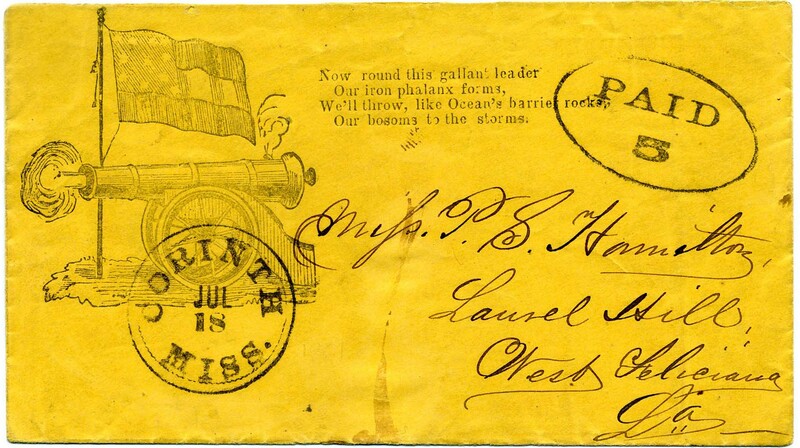 The letter accompanying the 20¢ cover has fascinating commentary on the sender's life in the Army of the Tennessee, with descriptions of battles and skirmishes and the recent completion of a raid on the rear of the Union Army. It is also strong with opinions and fervent patriotic spirit, including "I think that if our soldiers only resolved to dare & brave the dangers of the field, with the assistance of a just & merciful God, peace will crown our labors & hardships before many months elapse. As much as I desire the war to close, I am for fighting to the bitter end, until the Yankee Government grants us everything we ask for, & acknowledge the Southern Confederacy as on the 1st nations of the earth." The 20¢ cover illustrated in 1986 Dietz on p. 231 and in Wishnietsky's Confederate Patriotic Covers and Their Usages on p. 119. Ex Gallagher and Kilbourne. $2,200. Reuben Chapman was an Alabama lawyer who owned a cotton plantation in the state's "Black Belt." He served as a Democrat in the US House of Representatives (1835-1849) and as Alabama’s 13th Governor (1847-1849). Much more information on linked page. CSA 1c, 5¢ olive green, Stone A-B with 4 large margins, tied by balloon cancel of HORN LAKE / MISS // JAN / 3 /  on blue Jefferson Davis Medallion, 10 Stars and Verse patriotic cover (JD-1C, Verse 48) to Miss L. J. Brickell, Yazoo City, Miss., small piece of back flap missing, small sealed edge tear and light restoration, ex Matz, Brandon and Kilbourne. Has pizazz! $1,400. CSA 4, 5¢ dark blue tied by blurry strike of CORINTH / Miss. // MAR / 19  cds on 11-Star Confederate Flag patriotic design (F11-5, CCV $1,500 with common stamp), barely reduced at left not affecting design, few small cover scuffs and small scuff on stamp in corner, still Very Fine. 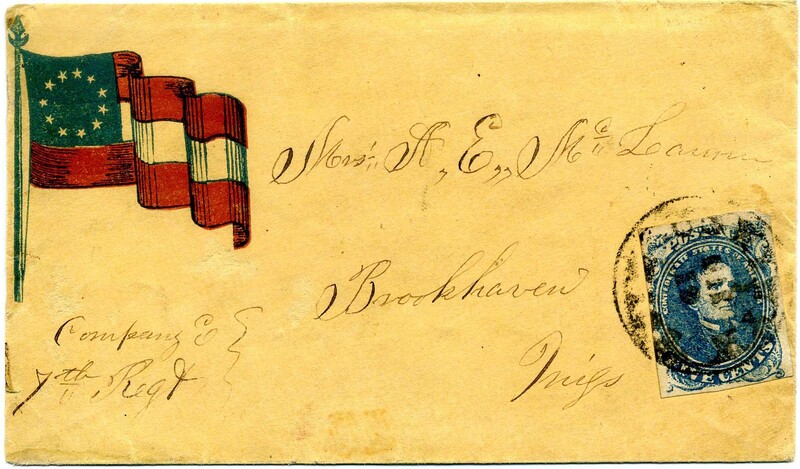 Addressed to Mrs. A. E. McLaurin, Brookhaven, Miss., with soldier’s endorsement at lower left “Company E, 7th [Mississippi] Regt.” SCV $2,500, ex Meroni and Kilbourne. $1,200. CSA 1-2, 5¢ green pair canceled pen strokes and tied CHATTANOOGA / Ten. // ? / 12 cds on "For Land & Life, Children and Wife" Soldier and 11-Star Confederate Flag patriotic cover (SN-4, CCV $3,000), depicts a Confederate officer (believed to be Beauregard) in uniform holding a saber in one hand and flag in other, small repair at bottom right corner, to Mrs. F. D. Hughes, Conwayboro So. Ca., Ex Ashbrook, Boshwit, Freeman and Kilbourne, 2007 PF certificate 458351. $3,000. CSA 1-2, 5¢ green tied WARRINGTON / Fla. // DEC / 28 cds on cover to Mrs. E. M. Holland, Scales Depot, Marshall Co[unty], Miss. 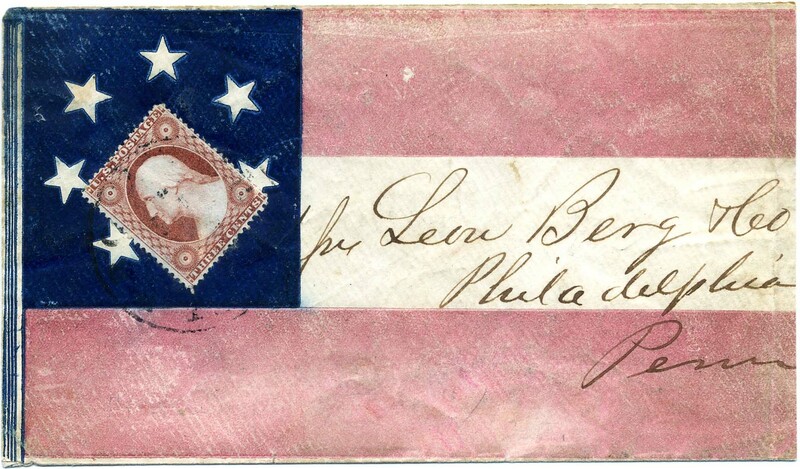 Sailor Nailing 11-Star Confederate Flag to Pole Patriotic sticker ornate frame (ST-4), expertly mended tears including at top and on flap but label is sound, Very Fine appearance and rare, this label's design is similar to that of a Palmetto Patriotic (FSC-2), this is one of only three recorded Warrington covers bearing this label, illustrated in Wishnietsky's Confederate Patriotic Covers and Their Usages on p. 134, CSA Catalog value $3,500 if tied, but these are very rarely tied (they aren’t postage stamps) and expertizing bodies frequently offer a “no opinion” when submitted, thus offered on its own merits. RARE. 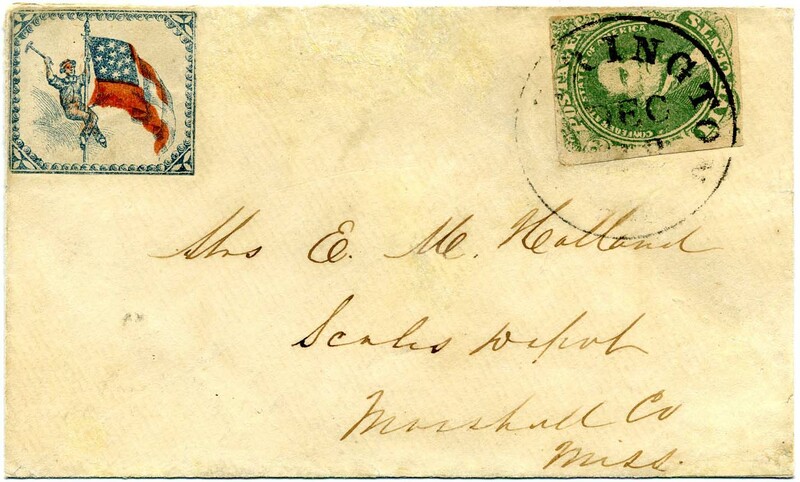 CSA 7, 5¢ blue vertical pair, both stamps faint diagonal creases, tied by GORDONSVILLE / VA. // AUG / 23 / 1862 cds on captured Union Standing Liberty Holding Flag Patriotic cover, addressed to Mary J. Wills, Horeb Post Office, Bedford County Va., soldier's endorsement from Lt. J. M. Bradley, Co. K, 58th Va. Regt. at top, cover is partially rebacked with top flap and one side flap added, also some edge wear and small corner mend at bottom, SCARCE. $550. James Monroe Bradley served in Company K, 58th Virginia Cavalry, Early’s Brigade, Ewell’s Division, 2nd Corps, Army Northern Virginia. More information on the linked page. 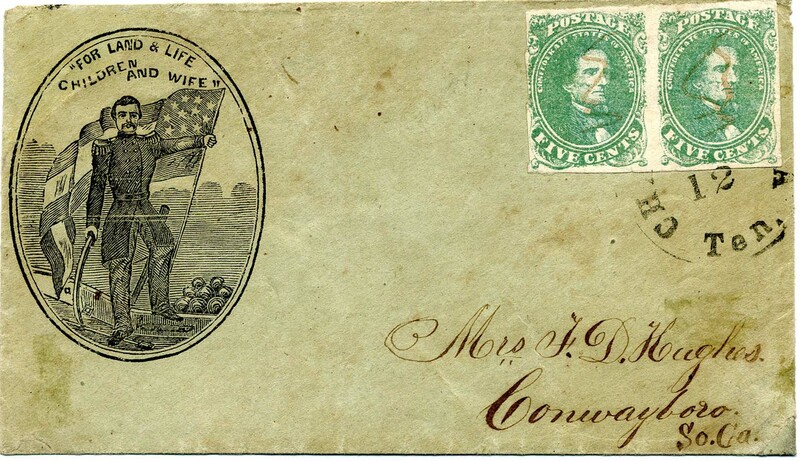 CSA 1c, 5¢ olive green tied light TUDOR HALL / VA. cds on Cannon and 12-star flag patriotic (CSA catalog CN-3, slogan 45, verse 39, CV $1,500 for design with common stamp, Scott CV CSA 1 on common patriotic $2,500), addressed to Mrs. D. E. Hutchison, Charlotte, N.C., slight staining, Ex Creighton Hart. $750. 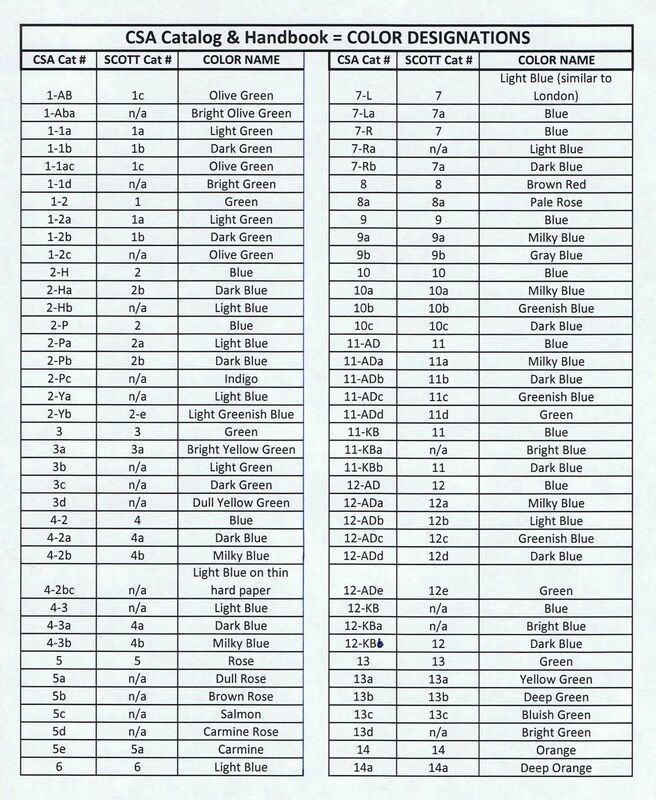 CSA 4a, 5¢ dark blue, Stone 3 (small faults) tied light GOLDSBOROUGH / N.C. cds on Cannon and 12-star flag patriotic (CSA catalog CN-3, verse 5, Bonitz imprint 17, CV $1,500 for design with common stamp, Scott CV CSA 4a on common patriotic $2,750), addressed to Mrs. M. F. Fields, Tawboro, N.C. 1983 CSA certificate, Ex Northcutt. $850.